Most riders consider black camels to be creatures of bad luck and misfortune. But if you're a thief riding off into the night with your ill-gotten gains, you might see things differently. 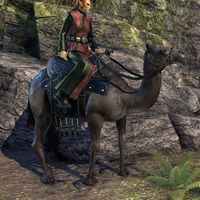 The Black Camel of Ill Omen is a black camel mount previously available in the Crown Store for 025002,500 , or in Flame Atronach crates as a Legendary-level reward. Its default name is "Unlucky". The Camel-Lizard Steed is available from the Xanmeer Crown Crates as an Apex-level reward. Its default name is "Moss-Spitter". Frankly, compared to war horses, bear mounts, and even saddle guaars, it's hard for Camels to look magnificent—until you dress them in Dragonscale Bard. Then look out! 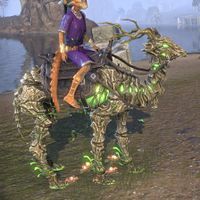 The Dragonscale Barded Camel was available from the Crown Store in the Dragonscale Crown Crates as an Apex-level reward. Its default name is "Humpty". Dwarven Camels are most often found among the ruins of the desert-dwelling Rourken clan of the Dwemer, who left northeast Tamriel and traveled west to found cities in the remote back-country of Hammerfell. The Dwarven Camel is a Dwarven Automaton-themed mount, or "vamidium". It is available from the Crown Store via Dwarven Crown Crates as an Apex-level reward. Its default name is "Mzan Nchark". When Peregrine Direnni passed her Master Conjurer test by summoning the first-ever Flame Atronach Camel, her mentor Corvus gave her high marks but was heard to comment, "Now you're just showing off." 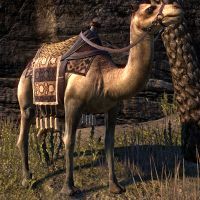 The Flame Atronach Camel is a Flame Atronach-themed camel is available as an Apex-level reward in Flame Atronach crates. Its default name is "Hotter-than-Sand". It's no surprise that in the Alik'r Desert, where blooming flowers are rare and prized, that Shorn Camels tattooed with Floral designs are well loved and popular. Covering them with flower designs is even said to make them less ornery! The Floral Tattoo Shorn Camel is (?). Its default name is "Inky Spit". Perhaps the Atmoran totems and dread-knots sported by the Frostbane Camel actually do help protect it from the bitter cold of Skyrim. Or maybe camels are just too ornery to care. The Frostbane Camel was available from the Crown Store in the Scalecaller Crown Crates as an Apex-level reward. Its default name is "Goosebumps". This is the stoic, hard-working beast that riders in the wastes of Hammerfell count on to survive. And if things come to a fight, it's just plain mean. The Hammerfell Camel is (?). Its default name is "Bumbiter". Even in the wastes of the Alik'r, far from Rivenspire, when the sun sets on a moonless Witches Festival night riders may find themselves headless, galloping across the darkling dunes on shadowy camels and clutching glimmering Hollowjacks. 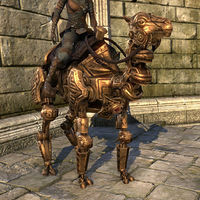 The Hollowjack Rider Camel is a mount available from the Crown Store via Hollowjack Crown Crates as Apex-level reward. Its default name is "Night Blossom". 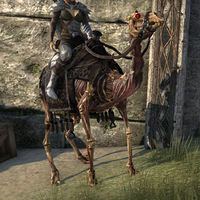 The Redguard hatred of necromancy means undead creatures are rare in Hammerfell - which will make you all the more special when you clatter in to the oasis on the back of a terrifying Skeletal Camel! 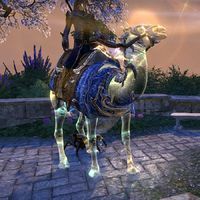 The Skeletal Camel is available in the Reaper's Harvest Crown Crates as an Apex-level reward. Its default name is "Bag-o'-Bones". The Altmer wizard Corvus Direnni astounded High King Ar-Azal of Hammerfell by conjuring a Storm Atronach that assumed the form of a horse—but when Ar-Azal tried to stump him by commanding he summon a Storm Atronach Camel, Corvus Direnni instantly did so! 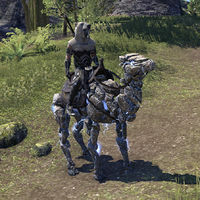 The Storm Atronach Camel is a storm atronach in the shape of a camel mount, available as an Apex-level reward in the Storm Atronach Crown Crate. Its default name is "Shock-Hump". The dervishes of Rihad shave their Hammerfell camels and tattoo them with mystic symbols sacred to the spirits of the deep desert, to placate those wayward spirits in hopes they'll refrain from leading the camels astray among the dunes. The Tattooed Shorn Camel is a camel mount that is available from the Crown Store via Hollowjack Crown Crates as an Legendary-level reward. Its default name is "Inky Spit". Y'ffre's Naming gave all the creatures of Nirn their shapes, even in the arid deserts of Tamriel. When its name comes magically unraveled, then a creature begins to forget its shape and devolve to a state between flora and fauna. Thus the Wild Hunt Camel. The Wild Hunt Camel is available as an Apex-level reward in the Wild Hunt Crown Crate. Its default name is "Crankyvines". It leaves behind green footprints, and small flowers briefly bloom where it stands still. The white camel is said to be sacred to Zeht, the Redguard god of food and farming. The devout folk of Hammerfell bow when a Cloud Camel rides past. The Zeht's Cloud Camel is a white camel mount previously available from the Crown Store for 1,900 in the 2016 Black Fredas bundle. Its default name is "Mirage". This page was last modified on 2 April 2019, at 16:51.